hello there. hello. hello. hello. hello. hello. that was a hello from each of us. who are we? we are a family of meowzas. 2 humans, 4 cats. but aren’t we all the same thing really? there’s pamela – that’s me, hi. there’s matthew – he’s my boo, i mention him often. essy – 19 years old, only eats soft food, spoiled, sleeps in a heated cabin – she has a blog. xanadu – 6 years old, siamese, crazy, talks to you, loves everyone, so smart, my baby. fiif bofinkles – 11 years old, kissing champion of the world, always on my lap, good girl. brother bear – 3 years old, the only boy, referred to as “goose”, furry belly, likes to slip on credit cards, will always be the baby. i love to cook and share recipes. 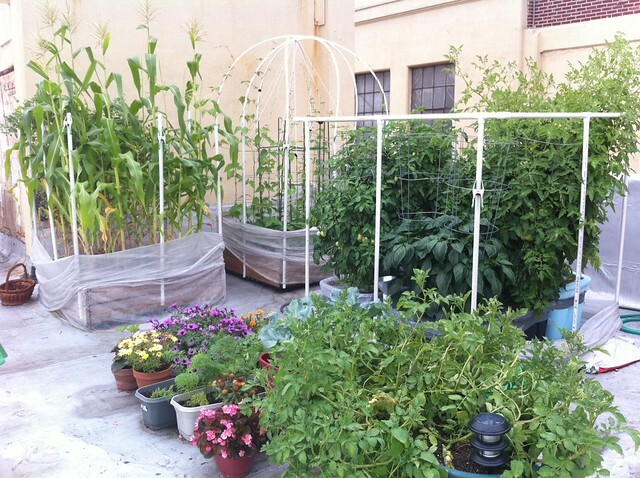 our rooftop garden in brooklyn. art and technology i want to share. random paragraphs when im feeling chatty. Wow! Nice garden! And growing on your roof? Excellent! Are those tomatoes? They look so healthy. Mine tend to get attacked by insects, and I don’t like using pesticides. I have 2 cats in my home. I’m not a fan of cats myself, but they’ve grown on me. They do goofy things that make me laugh. Hey Maui Yes, our garden is on the roof where we have to battle elements that we never expect! Our tomato plants last year did great, grew over 6 feet tall and produced pounds and pounds of fresh tomatoes – hoping they do just as good in the upcoming year. Glad to hear the kitties make you laugh, they’re good for snuggle time too.